Indian Forces continue to do Ceasefire 2003 violation on Line of Control in different sectors by firing and targeting the Civilian population. 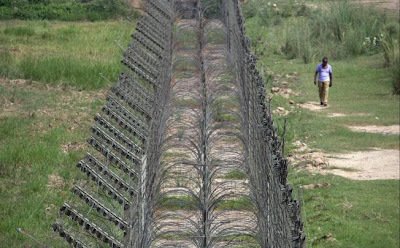 a 60 year old man was killed and his daughter got injured by firing of Indian security forces at LOC in Battal Sector on on Wednesday. Indian army has done several violations of ceasefire in last few days and targeted many Pakistani civilians. It all started on 6th August when India blamed Pakistan for killing 5 of Its soldiers at LOC. Indian authorities claimed that 5 Pakistani soldiers came 5 KM inside the LOC and killed 5 Indian soldiers. Pakistani officials has denied the allegation and called it a joke. Before this incident 4 Pakistani civilians were kidnapped and Killed by Indian forces at LOC. Name of these civilians were Zafran Ghulam Sarwar, Mohammad Wajid Akbar, Mohammad Faisal and Wajid Akbar. according to Indian Journalist Praveen Swami Indian forces first killed these 4 Pakistani citizens and then Pakistan killed 5 Indian soldiers in retaliation. Since then Indian Media and Politicians are doing massive propaganda against Pakistan. Indian media is running long documentaries against Pakistan. Politicians are doing political scoring for coming Indian elections in 2014. Pakistani High Commissioner in India Salman Bashir has said that we want to end tension with India. he also rejected allegations of killing 5 Indian soldiers by Pakistan army. He said there is no proof that Pakistan killed these 5 Indian soldiers.